Facebook rolled out a few unpredicted changes this week with an eye of getting users to communicate with friends in new ways. Probably the most important announcement was the Facebook groups function. (Not to be confused with the ability to create public Groups on Facebook.) Facebook CEO Mark Zuckerberg stated in the announcement that groups are going to create a fundamental shift in how people use Facebook. The way groups works is that you now can go through your list of friends and group them – family, work, fantasy football, clients, etc. The reason I think this has some potential for business is that you can then communicate in unique ways only with group members. 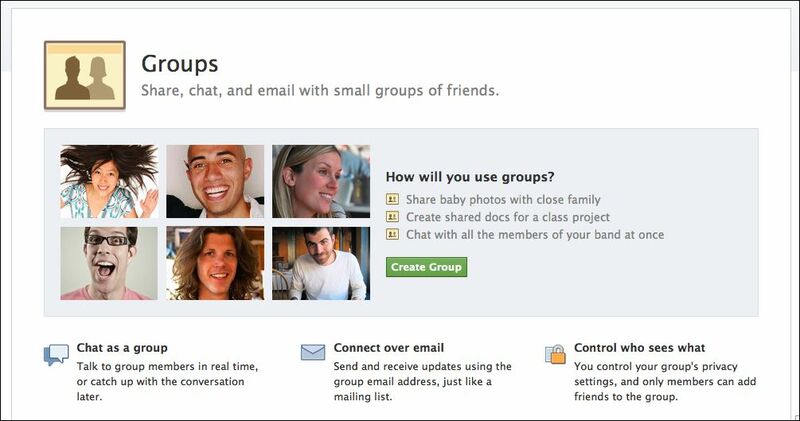 You can communicate via email, chat and even post documents to the group privately. Here are some initial ways I see business putting groups to work. You will see companies create private, customer only groups, and use the platform as a way to share information with this group. There’s also a group chat function that could make for some interesting business use as well. I think hosting live chats with your groups on Facebook might prove an effective way to create more engagement on the platform. This tool will also surely be used by companies as a way to privately share information internally. 2) Name your group and assign it an email address (grab them now as they email names are first come first serve) – after you set up group hit Edit Group to select an email.